Are you struggling with trading losses? Are you entering stocks to early or too late? Are you interested to learn how to increase your trading accuracy? If you can increase your trading accuracy, you will be able to make more profits in the stock market. Using multiple time frame analysis will help you to do that. The concept of using multiple time frame analysis to analyze stocks is rarely taught in detail. It's hard to find them in trading books and websites. When I first started trading, I didn't know the importance of multiple time frame analysis. But now I do and I'm going to show you why you need to master this "discipline". So what exactly is Multiple Time Frame Analysis? Don't let the word "multiple" scare you my friends. You can substitute the word "multiple" with "different". Then you get the title "Different Time Frame Analysis". What this means is you look at charts in different time frames. The above is a screenshot of a chart from investing.com. When you use charts, you will notice that there are different time frames being provided. The current chart above is the hourly time frame. When you click on the 1 day, it will bring out the daily chart. If you click on the 5 minute, it will bring out the 5 minute chart of the index. There is a reason why chart providers give us so many time frames. They know that there are different market participants in the market. Some will be day traders who will focus on 5 minute charts and some will be long term investors who will use the weekly charts. For me, I only use the 5 min, 15 min, 1 hour, daily, weekly and monthly charts. So all in all, I look at 6 time frames. 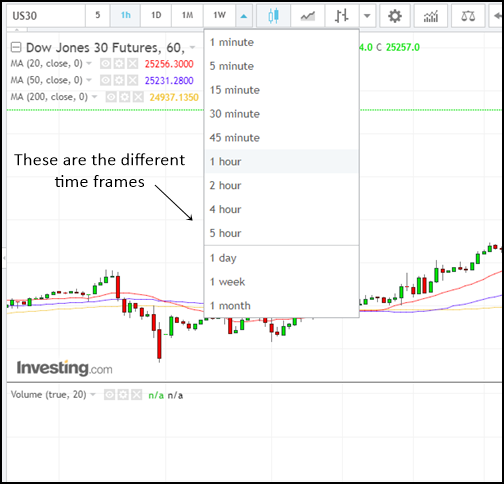 So what are the benefits of looking at different time frames? Just mentioning the benefits to you might seem a bit blur. "A picture is worth a thousand words" as they say. And in the stock market, a trading example is worth 10 pages of theory. Therefore, let me show you some case studies of how multiple time frame analysis can be used to trade stocks with accuracy. In fact the examples below are what I actually traded. Swing trading is a style of trading that buys and sell the stock within a few days. It captures the short term swings of the stock. This kind of trading may be too difficult for big funds, but they are excellent for self directed traders. One of the great ways to buy stocks for swing trading is to enter the stock when it drops to the rising 50 MA. As you may already know, the 50 MA can be a powerful psychological support. Therefore, many traders will enter the stock as it touches the rising 50 day moving average. The chart above is the daily chart of Apple stock. The blue line is the rising 50 day moving average. Notice how the stock bounced up when it touches the 50 MA? This provided a nice 2 day swing trade for observant traders. Now, the chart above with all the indicators and candlesticks may seem confusing to new traders. However, to the seasoned trader, it will be obvious that Apple was going to bounce up. So, now the trader has an idea in his mind that the stock will likely go up. Does he or she go out and straight away buy the stock immediately? The seasoned trader will now zoom into the 60 min chart, the 15 min chart and the 5 min chart to see what is happening. In fact, he or she will use these smaller time frame charts to time their entry. The chart above is the 60 min chart of Apple. Again, the chart with all the indicators can be very confusing to new traders. After all, you are probably learning something new. Don't worry, I will handhold you and guide you step by step. 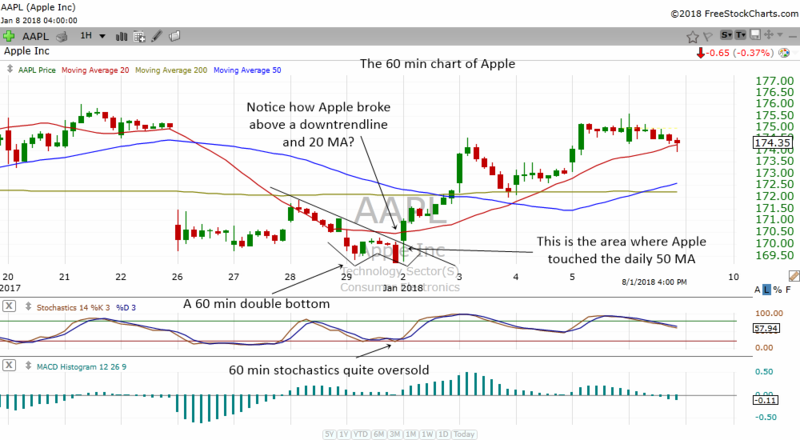 When you combine the ANALYSIS in the daily chart and the ANALYSIS in the 60 min chart, it can be very clear that Apple was going to go up. So how do you enter the stock? Well some traders might just enter the double bottom pattern in the 60 min chart. Some might zoom in again to the 15 min chart and 5 min chart to see how things are in the smaller time frame. Once you zoom into the 15 min chart, you can actually see quite a number of bullish things happening. All these hints to a bullish bias for the stock. When you combine the analysis in the daily chart and 60 min chart and now the 15 min chart, you get a clear picture that the bias for this stock is up. 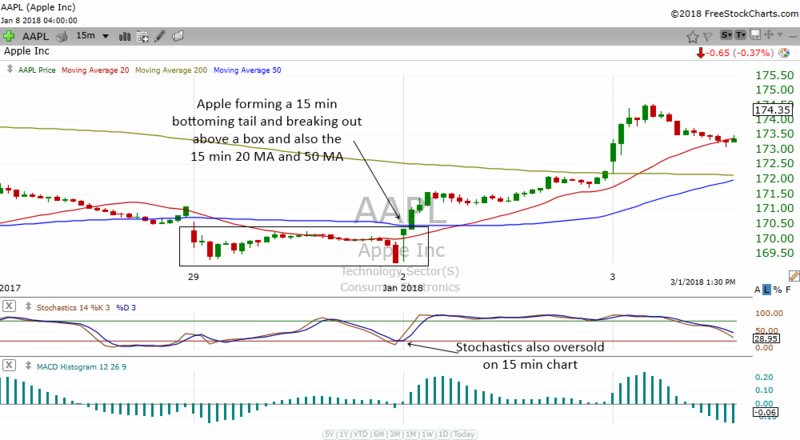 So, how do you enter Apple using the 15 min chart? Well, some trader might buy the opening bell's 15 min bottoming tail. They will buy the moment Apple trades above the highs of the bottoming tail. You could also buy the moment the stock trades above the 15 min box. Or you could buy the stock when it trades above the 15 min 50 MA. It all depends on your entry criteria and how you prefer to enter. There is no one size fits all rule. Some traders will also like to zoom in further into the 5 min chart. Let's take a look at the 5 min chart of Apple below. The chart above is the 5 min chart of Apple on the day it exploded higher. I just want to mention that each trader will have their own settings and preference on a stock chart. For me, I like to use the 20 MA, 50 MA and 200 MA and stochastics and MACD. You will probably notice that this 5 min chart is different from the previous daily chart, hourly chart and 15 min chart of Apple. That's because I have taken out the stochastics and MACD. Then I colored the area below the 5 min 50 MA RED. This is a simple way for me to know when it's best to buy stocks for day trading and when to avoid buying the stock. If the stock is below the 5 min 50 MA (red zone) then it's best to avoid the stock. 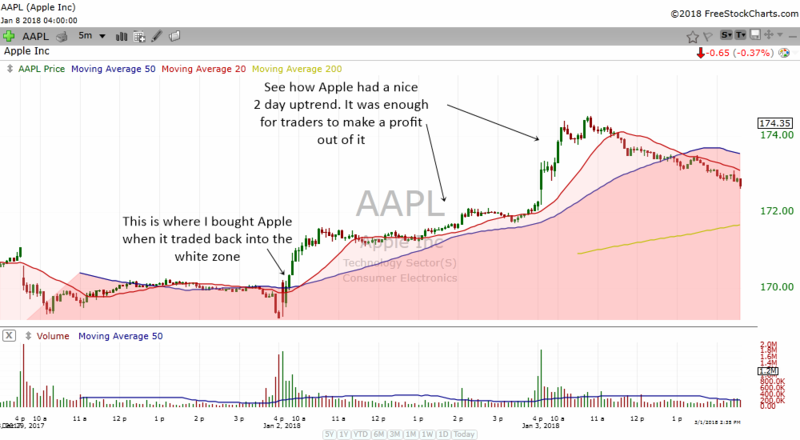 When the stock traded from the red zone back to the white zone, I entered and bought Apple. Yes, this is a trade that I have taken and I'm sharing with you my trading experience. Of course, I must admit that I did not have the detailed analysis I have written above when I entered this stock. And it's the same with the other example below. In hindsight, I looked at them and annotated them for your benefit. This is where a trading strategy comes in handy. In fact, the way I entered Apple, was using the The 5MD50 Bullish Trading Strategy. You can find the exact step by step procedures to find and trade stocks using this trading strategy in the article. The next question you might ask is how do we take profits? In order to take profits, we once again refer to the charts. Since this is a swing trading strategy, we need to be on the lookout for possible resistance areas. For that, we once again look at the 60 min chart of Apple. Notice how the stock had a nice bullish run up on the 2nd to 3rd of January 2018? As the stock run up to the resistance area on the left, I sold off some of the shares in Apple. Selling some of your position as the stock reaches a resistance area is a good strategy. You can sell 1/3 or 1/2 to take some profits off the table. It is also very beneficial psychologically to take some profits. You know that you have some winnings in the hand. If you look at the chart, Apple actually formed a short term top right at the resistance. A small topping tail formed and the stock started to correct. There were actually 2 other trading opportunities that occur in the stock. I did mention them in the US Market Trading Telegram Group. Those of you who read my commentary would know about it. We won't go into detail about those 2 other trading opportunities. Its too long for this article. That will be a story for another day. How Do You Recognize Important Patterns, Indicator Signals And Turning Points In Different Time Frames? I think it must have taken you quite some time to absorb the case study in Apple. Imagine having to analyze the stock in your brain in the heat of the battle. Sometimes, stocks can move up so rapidly that you just don't have that much time think. This is where experience comes in. A new trader might not be able to digest so much information quickly. But for a seasoned trader who does all these day in day out, it will be easier. Therefore, learning to trade takes time. How do you combine all the analysis in different time frames to come out with the best time to enter a stock? Yes, it is very very confusing for the beginner. But here is the way to fix the problem. 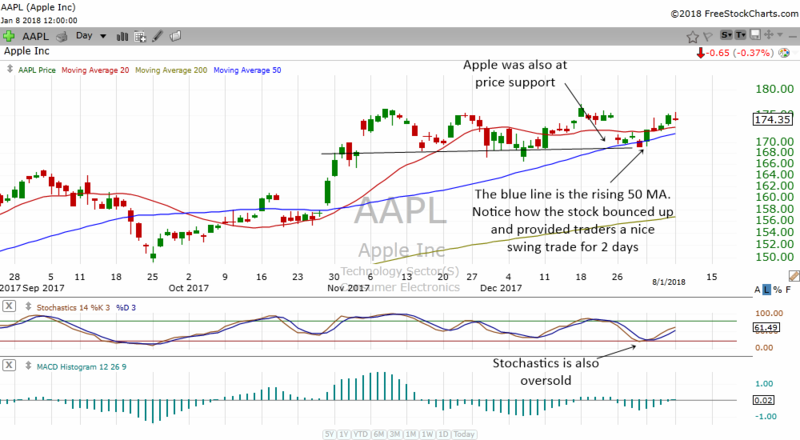 Using the example of Apple above, we start to consider Apple as a swing trading candidate as it corrects to the rising 50 MA. Then we zoom into the 60 min chart and 15 min chart and 5 min chart to see if there are any signs of bottoming and bullish reversal. Finally, after taking the trade, we look for resistance areas to see where we should consider taking profits. All these will take time to learn my friends. Which is why I highly recommend that you start the Trading Course on this website. It's free and pack with lots of information for you. p.s. I'm still in the process of completing the Trading Course. Because I trade during market hours, I might not have much time to write at times. But it's about 70% complete. Did you know that an oversold stochastics in the daily chart can sometimes give us a nice trading opportunity? There are many settings but I use the default setting of 14,3,3. When the stochastics drop below 20, it is considered oversold. That is when we can go in to buy the stocks for a swing trade. 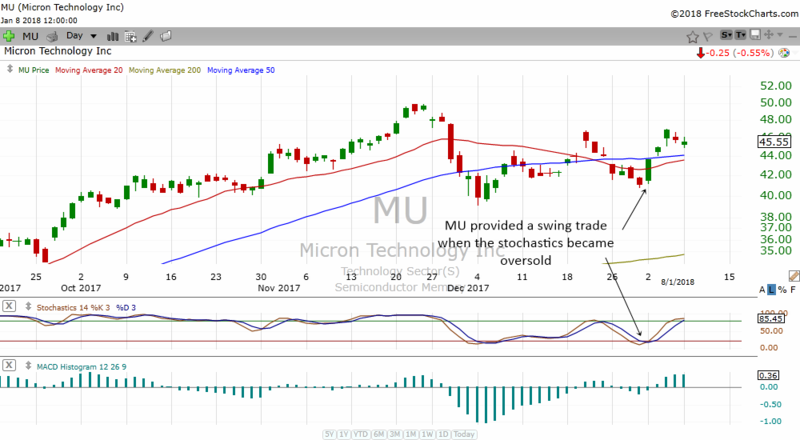 The chart above is the daily chart of MU. Recently, the daily stochastics in the stock became quite oversold. That was when I started to put this stock on my watchlist. I do not simply choose any stocks that have an oversold stochastics. I usually require the stochastics to have a smooth railroad track as it moves from overbought to oversold. Meaning the two lines that make up the stochastics are parallel to each other. If the stochastics is not clean and zig zags here and there as it moves to oversold level, I will avoid the stock. 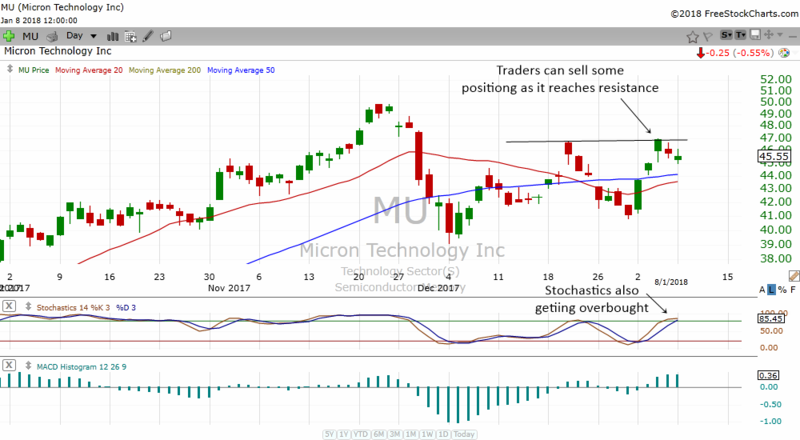 When you look at the stochastics in the MU chart above, you can see how it moves to oversold smoothly and then it moves back to overbought smoothly. Let us zoom into the 60 min chart to see what happened. 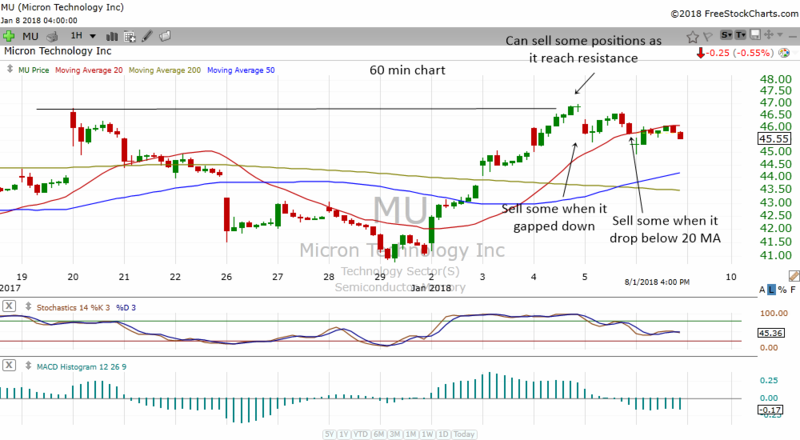 The chart above is the 60 min chart of MU. 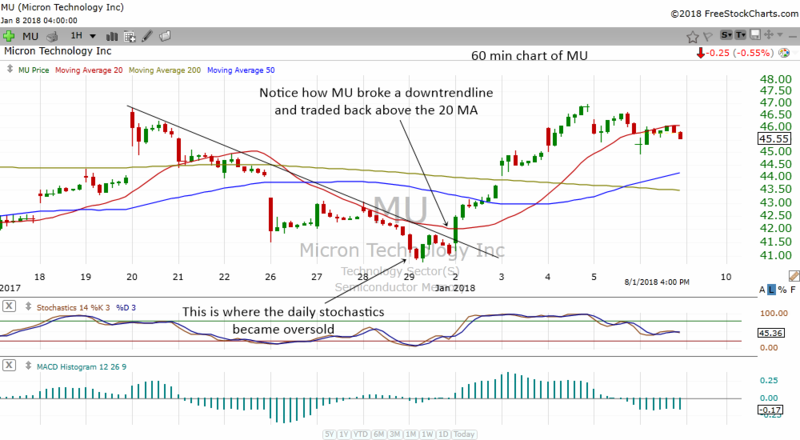 When you combine the daily oversold stochastics with the analysis of the 60 min chart, you begin to get a clear picture that MU wants to go higher. So, how do we enter the stock as early as possible before others? This is where the 15 min chart comes in. When you zoom into the 15 min chart, you will notice that the stock provided a nice entry. 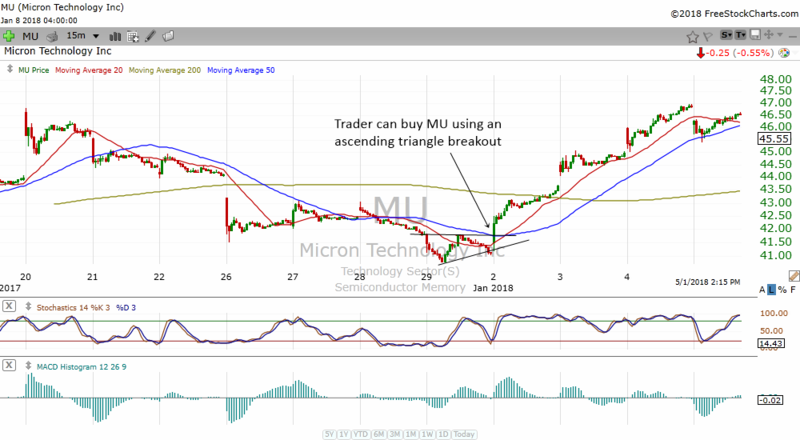 MU actually formed a 15 ascending triangle bottom. Traders could have bought the breakout. Do you see now how we can use different time frames to analyze a stock and enter at the best possible price? Therefore, this is a high probability trade for swing trading. Now, let's zoom into the 5 min chart and see what it tells us. As you will notice, the 5 min charts is different from the rest. Just like the Apple case study I showed you, I like to use red zones (below 5 min 50 MA) and white zones (above 5 min 50 MA) as a market timing tool for day trading. 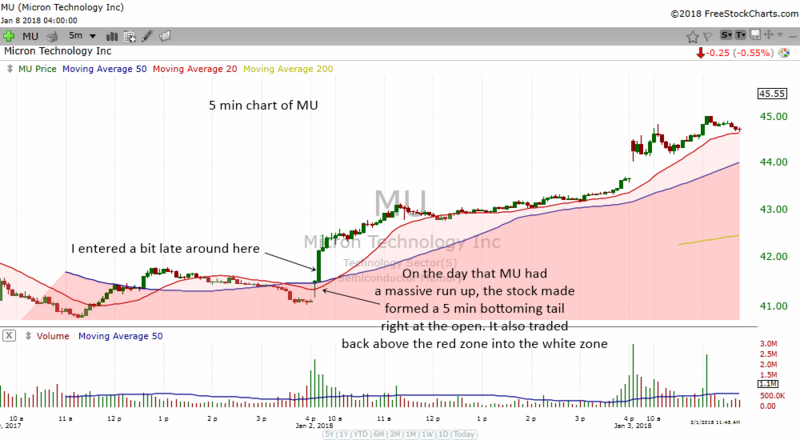 On the day that MU had a massive run up, the stock actually made a 5 min bottoming tail at the opening bell. This is a trading strategy I called 5 Min Opening Bell Bottoming Tail Trading Strategy which you can read in detail in the article. Basically, what you do is look for a bottoming tail in the 5 min chart right after the open. Then you buy the moment the stock trades above the highs of the bottoming tail. Notice the big green candle right after the bottoming tail? I was a bit late and got in around the middle of the big candle after the bottoming tail. But it did not matter. Remember in the 15 min chart MU was forming a 15 min ascending triangle breakout. So, even if I was late in the 5 min chart, I was still quite early in the overall swing trading picture. That is how you get in early using Multiple Time Frame Analysis. Now that we have gotten into the trade, how do we take profits? 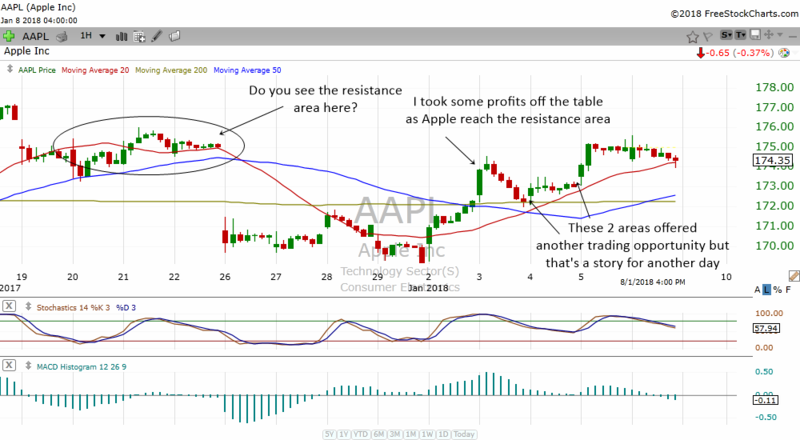 Just like Apple, we need to look for resistance areas. So once again we employ charts in other time frames to help us get out of the stock. You have to realize this is a swing trade. So, its best to take some profits off the table. The daily chart above shows how we can sell some positions. Traders can sell some as it reaches price resistance. Note that the stochastics was also becoming overbought. If you zoom into the 60 min chart, it gives you a better understanding on how to take profits off the table. You could have sold off 1/3 when the stock reached price resistance. Then when it gapped down the next day (which is a sign of weakness), you could have sold another 1/3 of it. When the stock drops below the 20 MA, you can sell the remaining 1/3. What if the stock goes up later? Well, we can always buy it back again for another swing trade using another trading strategy. Swing trades are meant to be short term trading activities. Do not turn it into a buy and hold if the charts are not favorable. A few nice swing trades can add up a lot to your account. There is no need to go for a home run in every trade. Welcome to the world of Multiple Time Frame analysis my friends. It may take some time to get use to this new type of analysis. Read this article again and again until you can fully absorb how it works. I will try to put in more examples as time goes by.